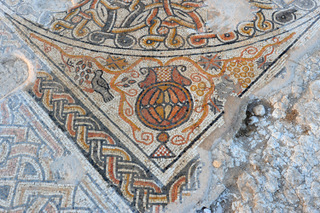 A spectacular colorful mosaic dating to the Byzantine period (4th–6th centuries CE) was exposed in recent weeks in the fields of Kibbutz Bet Qama, in the B’nei Shimon regional council. 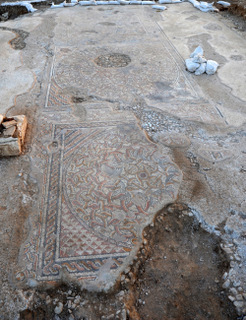 The mosaic was discovered within the framework of an archaeological excavation the Israel Antiquities Authority is carrying out prior to the construction of an interchange between Ma’ahaz and Devira Junction, undertaken and funded by the Cross-Israel Highway Company. Remains of a settlement that extends across more than six dunams were uncovered in the excavation being conducted on the kibbutz’s farmland and directed by Dr. Rina Avner of the Israel Antiquities Authority. The main building at the site was a large hall 12 meters long by 8.5 meters wide and its ceiling was apparently covered with roof tiles. The hall’s impressive opening and the breathtaking mosaic that adorns its floor suggest that the structure was a public building. The well-preserved mosaic is decorated with geometric patterns and its corners are enhanced with amphorae (jars used to transport wine), a pair of peacocks, and a pair of doves pecking at grapes on a tendril. These are common designs that are known from this period; however, what makes this mosaic unique is the large number of motifs that were incorporated in one carpet. Pools and a system of channels and pipes between them used to convey water were discovered in front of the building. Steps were exposed in one of the pools and its walls were treated with colored plaster (fresco). Archaeologists in the Antiquities Authority are still trying to determine the purpose of the impressive public building and the pools whose construction required considerable economic resources. The site, which was located along an ancient road that ran north from Be’er Sheva, seems to have consisted of a large estate that included a church, residential buildings and storerooms, a large cistern, a public building and pools surrounded by farmland. Presumably one of the structures served as an inn for travelers who visited the place. During the Byzantine period Jewish and Christian settlements in the region were located next to each other. Two of the nearby Jewish settlements are Horbat Rimon, where a synagogue and ritual bath (miqwe) were exposed, and the Nahal Shoval antiquities site, recently excavated prior to the construction of the Cross-Israel Highway, where ritual baths were uncovered. Noteworthy among the Christian settlements are the churches at Abu Hof in Lahav Forest and the monastery at Givot Bar.